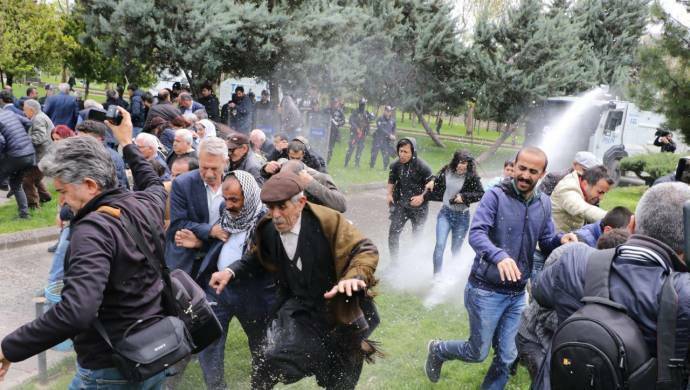 Peoples’ Democratic Party’s (HDP) press briefing in Turkey’s southeastern city of Diyarbakir became a target of the riot police on Wednesday, with the latter’s use of force reportedly leaving an MP injured. HDP MPs and supporters gathered to issue a press statement on the isolation terms implemented on the outlawed Kurdistan Workers’ Party (PKK) leader Abdullah Ocalan, and the election authority’s latest decision to avoid giving mandates to the mayor-elects who were dismissed by emergency decrees. The riot police charged at the group before the statement, leaving HDP MP Remziye Tosun unconscious according to the report of Mezopotamya news agency. An ambulance took Tosun to a nearby hospital where she still recovers, the report says. HDP MP Remziye Tosun passed out after police charged at the group. The new co-mayors of the Diyarbakir municipality were also at the scene, where the police charged at the group with water cannons. HDP MPs Semra Guzel and Musa Farisogullari were also attacked by the police according to the report. Mezopotamya reports ensuing tensions in the district. Turkey’s Supreme Electoral Council (YSK) previously has ruled that mayor-elects of the March 31 local election who were laid off from their posts by decrees issued by the government following the failed 2016 coup will not be allowed to take their office. Before the latest polls, Turkey’s Kurdish-majority southeast had overwhelmingly been governed by the appointed trustees instead of elected mayors on the pretext of alleged ties with the outlawed PKK.